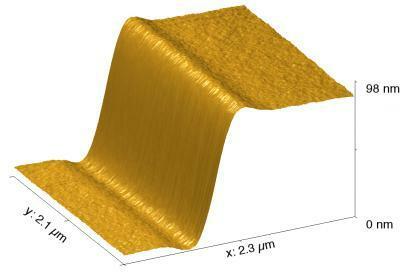 In a series of experiments, University of Waterloo researchers and colleagues started with very thin slices of polystyrene stacked to create tiny staircase-like steps about 100-nanometers high -- less than 0.001 per cent the thickness of a human hair. They then measured these steps as they became shorter, wider and less defined over time. The paper investigated how the top layer of glassy polymers is always moving despite the layers underneath being frozen or solid-like. The gold graph represents how the top surface is moving at one point in time.